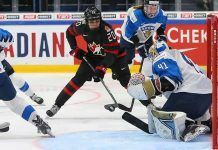 Emily Clark (Saskatoon, Sask./University of Wisconsin, WCHA) scored two of the four Canadian goals in the third period, helping Canada’s National Women’s Team to a 6-0 win over Switzerland in the opening game Thursday at the 2019 IIHF Women’s World Championship. The Canadians improved to 6-0 all-time against the Swiss at women’s worlds, and have never allowed a goal, outscoring the European side 56-0. Natalie Spooner (Scarborough, Ont./Toronto, CWHL) added a goal and an assist for Canada, while Renata Fast (Burlington, Ont./Toronto, CWHL) and Laura Fortino (Hamilton, Ont./Markham, CWHL) chipped in with two helpers apiece. Shannon Szabados (Edmonton, Alta./Buffalo, NWHL) needed to make just six saves to record the shutout and earn her 50th career win with Team Canada. Loren Gabel (Kitchener, Ont./Clarkson University, ECAC) got the scoring started just past the nine-minute mark of the first period, taking a drop pass from Brianne Jenner (Oakville, Ont./Calgary, CWHL) and snapping a quick shot under the glove of Swiss goaltender Andrea Brandli, and Spooner went upstairs on Brandli just seconds later to double the advantage. The Swiss netminder was the story in the second period, turning aside all 18 shots she faced to keep it a two-goal game after 40 minutes, but the Canadians pulled away in the third; they held Switzerland without a shot on goal while directing 21 at an under-siege Brandli. Clark potted her first just 95 seconds into the final frame, crashing the net off a set-up from Spooner, and she redirected in a Jocelyne Larocque (Ste. Anne, Man./Markham, CWHL) shot six minutes later to make it 4-0. Jamie Lee Rattray (Kanata, Ont./Markham, CWHL) tipped in a blast from Fortino at 12:54 for the 5-0 goal, and Blayre Turnbull (Stellarton, N.S./Calgary, CWHL) beat Brandli upstairs with a gorgeous redirection from the high slot at 18:03 to cap the scoring. Canada finished with a 53-6 advantage in shots, including 39-2 over the final two periods. 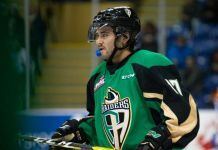 Preliminary-round action continues Saturday (12:30 p.m. ET/9:30 a.m. PT) when the Canadians face the United States in the marquee match-up of the group stage.